After every race we get inundated with reports from all the teams so we’ve compiled a collection of the reactions to the weekends racing to let you see first hand what the riders and team managers thought of their performances. Below is a collection of quotes from riders and managers in the British and World Superbike championships. Read a full behind the scenes report on all the weekend’s racing action only in MCN, out Wednesday, April 27. Jack Valentine, Foggy Petronas Team manager: "The whole team has put in an extremely motivated performance and we are not getting the results we feel we deserve. The riders are pushing hard to pick up as many points as possible, as could be seen in Steve's crash in the first race. I would put his result in the second race down to a tyre problem, although we know we are still struggling with punch out of the corners. Garry was unlucky in both races. I think we have benefited from using the latest engine development here and, although we have more work to do at Monza, we are hoping that circuit will suit the engine better than this tight track." Steve Martin, Foggy Petronas, retired race 1, 17th race 2: "There are not too many positives to take out of the weekend, although we will hopefully get some benefit from using the latest engine during qualifying here when we go to Monza. I tried my hardest in the second race and the bike was better in the braking areas than in the first race. But, when the tyre started to go off, I didn't have enough control or feel. 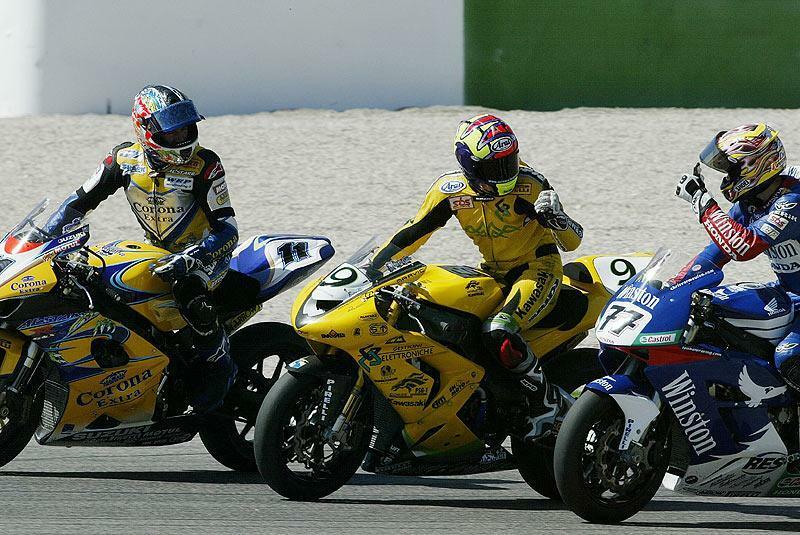 In the first race, Nieto was holding me up and if I had sat there any longer the pack behind me would have come past. I had overtaken him twice but he immediately passed me back down the start-finish straight. I lost the front end trying to make another overtaking move stick because, if I had got past him at that part of the circuit, I would have half a lap in which to make a bit of a gap on him." Garry McCoy, Foggy Petronas, retired both races: "Unfortunately, this was just a repeat of Phillip Island for me. After not finishing the first race, I went into the second really wanting to finish, no matter what. But, from starting where we are on the grid, we are playing around with people that we shouldn't be. I was playing everything pretty safe but Silva had passed me three times already and each time had run wide. On lap four I passed him again down the front straight and, as I started braking, he flew back past and ran wide again. Then he came from off line into the white paint and left me with nowhere to go. When we touched, my rear end lost traction and span me round. In the first race I noticed on the grid that we had a bit more tail wind than we had had all weekend, which worried me. Sure enough, I was running out of gears at the end of the straight and was on the hard limiter a couple of times. I was being patient with the guys in front as a few of them were pushing very hard but I was losing out on the straights and getting held up in the corners before the engine problem occurred. So I decided to use the latest specification engine for race two and wanted to get as much information for Monza as possible." Colin Wright, Ducati Airwaves Team Manager: “This weekend has been hard work for all teams and competitors, Mallory Park has always been recognised as the friendly circuit! I think the championship has outgrown Mallory, it is now not big enough to cope with a BSB round. However, we are pleased to come away with another bundle of points and are looking forward to Oulton Park”. Leon Haslam, Ducati Airwaves, 3rd race 1 5th race 2: “It has been a tough weekend, especially with all the restarts in the races. In race one I had a few problems but was running consistently quick and was pleased to get on the podium. We planned a few changes for race two but following the restarts we decided to change my tyres for the shortened twelve lap dash. I set my fastest lap on the final lap which has left my spirits high for next week. To take away a third and a fifth from the round is brilliant, especially with many of my favourite circuits still to come”. Glen Richards, Hawk Kawasaki, to second places: “You know, I’m thrilled. This is my best ever result, and to do it here, at the team’s home circuit means so much. Everyone in the team puts so much work into my bikes and I just want to get the results to pay them back, so I couldn’t be happier. My family is here watching me, and the team has a lot of support here so it’s great to be able to put on a good show for them. The plan now is to just keep firing in the points and see where we can end up at the end of the year”. Dean Thomas, Hawk Kawasaki, 6th race 1 4th race 2: “It’s been a good day, if a little bit weird. The team have been just superb this weekend, can’t fault them. I’ve come on, the bike is brilliant and we’re working so hard together. I’m not so pleased with my first race result, but considering I thought I was off the bike at Gerrards and heading for the grass I’ll take sixth with no complaints! The second, or third or fourth, depending on how you look at it, race was better. I just need that little bit extra. I was looking at Glen while I was chasing him, and I just couldn’t do anything about him, he knows this place so well. Hats off, he’s at the top of his game and did well. For me, once again I’ve improved my results, got quicker on the bike and that elusive podium can’t be far away now. It’s been good and now I’m looking forward to Oulton”. Regis Laconi, Ducati Corse, crashed in warmup, didn’t race: "I am fine but now I just need a few days to recover for Monza. It's a track I like, we are at home and Ducati is always very fast. This was a very big crash and I feel very lucky because I could easily have broken something and been out of action for some time. I am obviously disappointed because I wanted to take part in the second race, but I did receive a big bang on the head and was unconscious for a few minutes so the doctors said it was better that I didn't." James Toseland, Ducati Corse, 8th race 1 19th race 2: "I was riding round with people I shouldn't be riding round with, given the qualifying position. I got a decent start again but going into turn 4 a Yamaha came steaming underneath me and pushed me really wide. I was lucky to stay on and then had to change the front tyre because the brakes were locking up. Monza is the next race, we just need to find some traction because there's not much wrong with the top speed of the bike. We're struggling and we need to find the form again but there's nothing wrong with the bike and nothing wrong with me. We rode hard in the first race but couldn't really do much more after going off the track in race 2." Scott Smart, Rizla Suzuki, 5th race 1 8th race 2: "I nearly took third and my first podium of the season in the first race. I had the pace on the two guys in front of me but I just couldn't force my way past them. We had three starts in the second race and every one of them was poor. Once I got going, I was running the same times as the leaders, so there's nothing wrong with my Rizla Suzuki - we just need to get off the line quicker and we'll be working specifically on that for Oulton Park next week." John Reynolds, Rizla Suzuki, Retired race 1 didn’t start race 2: "In the opening race I was getting beaten up at every corner and my right leg was cramping badly. I made the call to retire to the pits because of the pain and an inability to ride in my normal aggressive style. I sat down with my crew after the race and we had a good heart-to-heart. We decided I should withdraw from the second race of the day as I honestly didn't think I could get in the points. I see my doctor on Tuesday and will have intensive physiotherapy after that. Robert Wicks, Rizla Suzuki Team Manager: "Well done to Scott for scoring his season best performance with a fifth place in the opening race. He was riding his Rizla Suzuki as hard as he could and was racing for the final podium position right until the last lap when he ran wide trying to make a pass stick. Today is another step forward in Scott's season and it's great to see him fighting at the front - we'll be after more of the same at Oulton Park. JR made a tough call today by coming in. It was obvious he was in a lot of pain with his right leg and couldn't continue under those circumstances. We will now let the dust settle and see how he responds to treatment through the course of next week." Paolo Ciabatti, Ducati Xerox Team director: "Unfortunately it was a weekend to forget for us. This morning Regis was quicker than everyone in the warm-up but his crash meant that he could not take part in the two races, in which I am sure he would have given Corser a hard time. James on the other hand, was unable to find the right direction in qualifying and this conditioned his two races on Sunday. Now is the time to concentrate on Monza and focus all of our energies on the next round, which is traditionally an important appointment for Superbike and for Ducati."